Cool peeps. And a refuge from cabin fever. 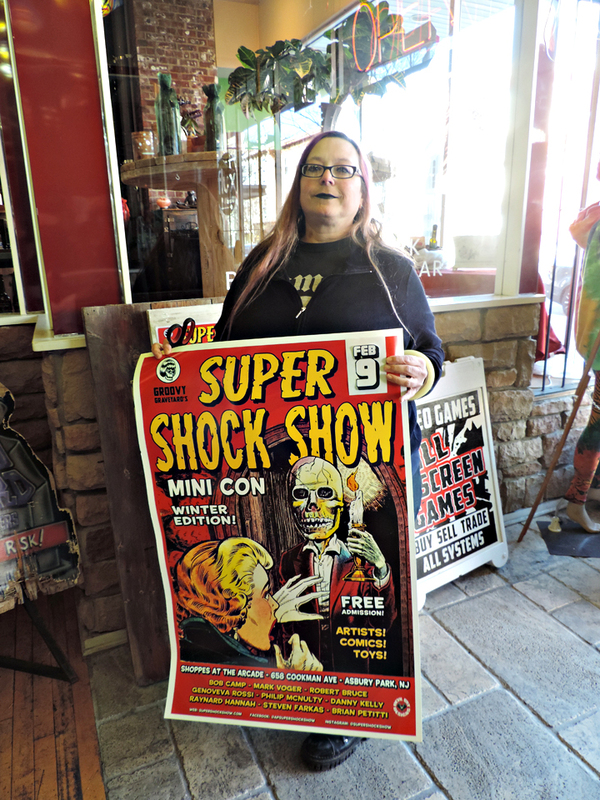 The second edition of the Super Shock Show held at Groovy Graveyard in Asbury Park on Feb. 9, 2019, provided an impetus to brave the bone-chilling cold, engage in interesting chatter, and ogle sweet merch and artwork. 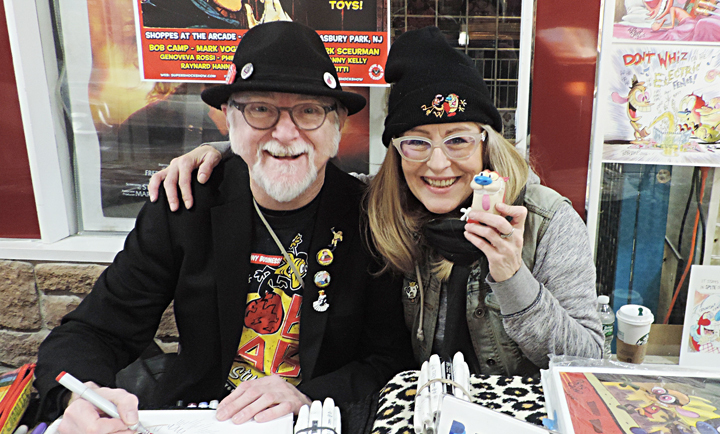 Eric Krause — the show’s organizer and the proprietor of Groovy Graveyard — assembled another eclectic guest list, heavy on the artists. McNulty is a fanatical fan of Tim Burton‘s 1989 movie “Batman,” and wore a T-shirt with the yellow oval bat emblem that came to symbolize that film in marketing and memory. 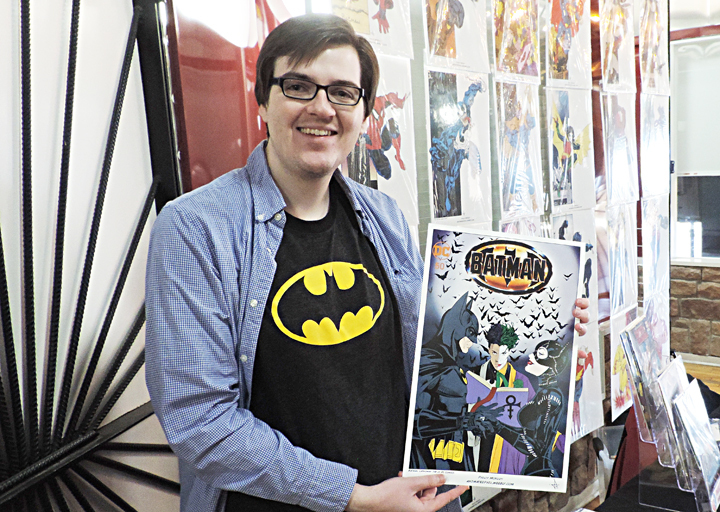 The artist displayed a print of his cover for DC Comics’ “Batman” #60, which underscores his passion for the ’89 film. He depicts the Michael Keaton Batman marrying the Michelle Pfeiffer Catwoman (from the 1992 sequel) in a ceremony officiated by … music icon Prince. Prince‘s face is split down the middle, Two-Face style, but he’s not Two-Face. One half is Prince, the other is the Joker. It all makes instant sense. The logo atop the cover is, literally, the original logo from the 1989 film, cheezy ’80s airbrushing and all. (This was before Photoshop was widely used, making the logo a veritable graphic artifact.) Said McNulty, “It’s the greatest gift DC could have given me: that logo in 600 DPI” — a large size for optimum reproduction, to non-graphics-nerds. 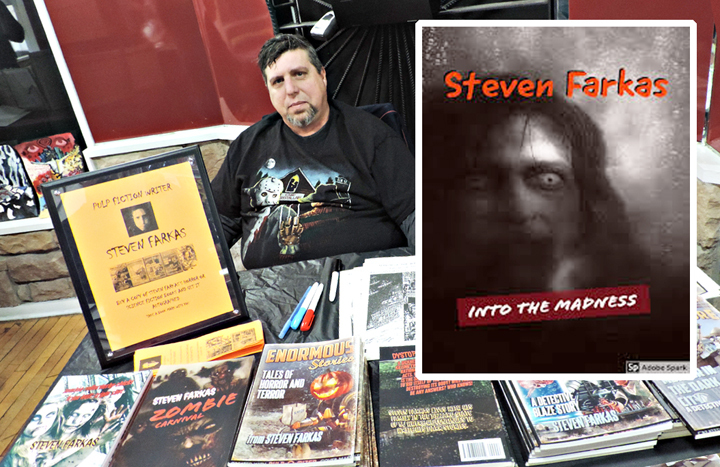 Another inspiration was Todd McFarlane‘s run on Marvel’s “Spider-Man” comic books. Later, when McFarlane kicked off “Spawn,” McNulty collected the books, but wasn’t permitted to read them. His father, also a comic book guy, told young Philip he could look at the covers (which were bagged-and-boarded), but would have to grow up a bit more before actually reading the stories, due to their dark adult themes. Here is scream queen Genoveva Rossi, whose films include “I Was a Teenage Alien Mutant Cyborg,” “Soulless 2” and “Soulless 3.” Rossi is in “BloodMania,” which was co-directed by horror legend Herschell Gordon Lewis, the filmmaker behind the groundbreaking 1963 gore classic “Blood Feast” who died at age 90 in 2016. 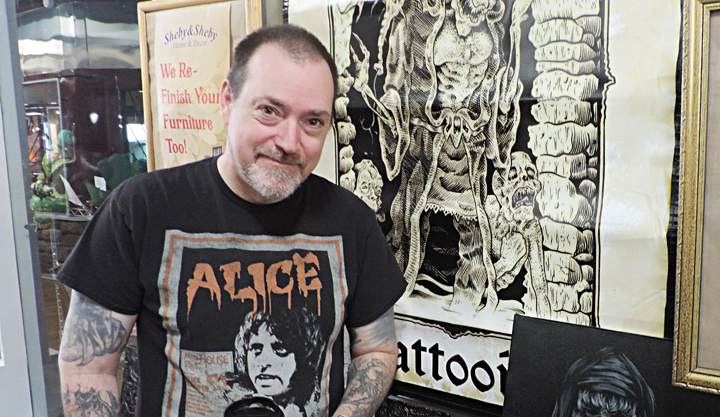 Speaking of the macabre, the art of Danny Kelly is often about death. In Kelly’s work — which would be at home in Tim Burton animation — he depicts such morbid figures as Edgar Allan Poe, Gomez and Morticia Addams, Leatherface, and the Bride of Frankenstein, a recurring subject. 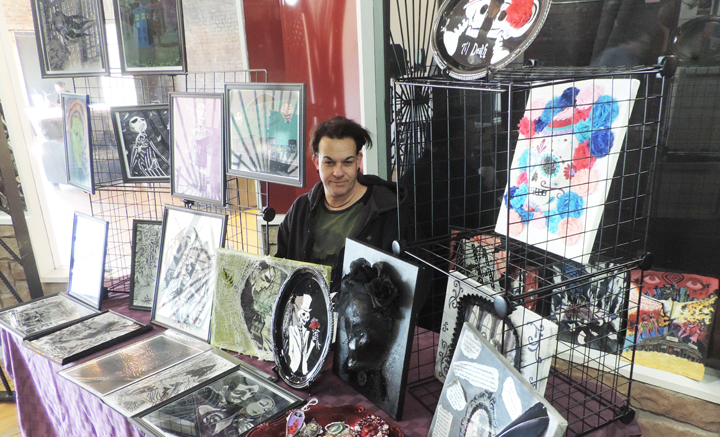 Kelly’s art goes beyond prints to jewelry such as broaches featuring his imagery. 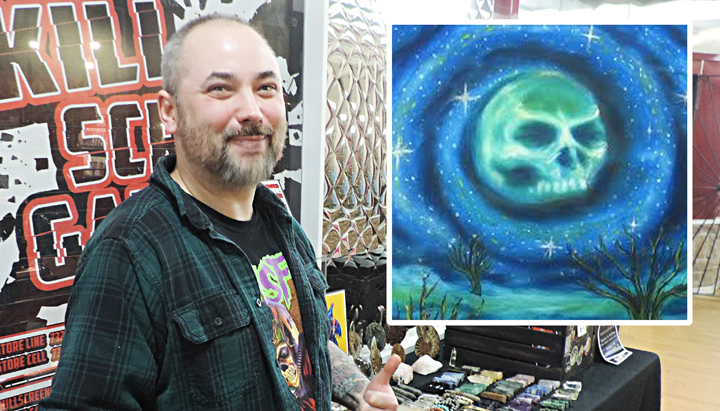 Kelly scores local cred with his illustration of a zombie apocalypse amid Asbury Park’s old Palace Amusements building — not in its heyday, but in its final, “crumbling” period. Here’s Reg Satana, who long ago earned local-legend status as a drummer, scenemaker and all-around hilarious person. 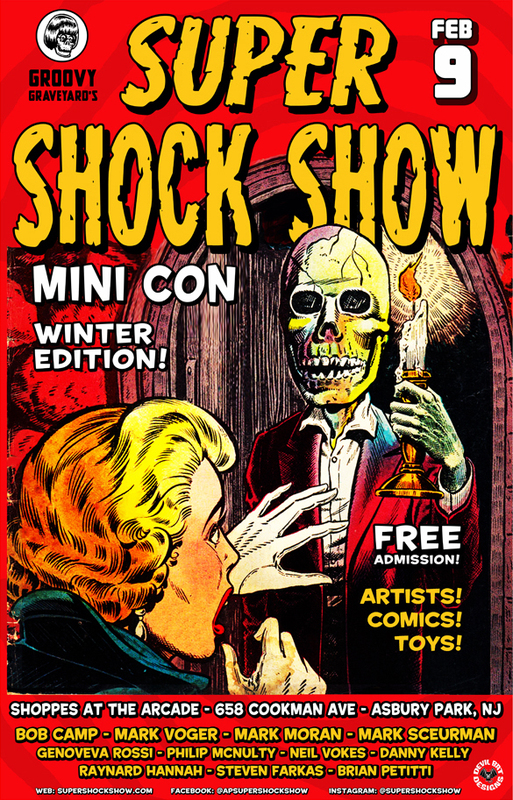 And here’s the Super Shock Show II poster, designed by Eric using (what else?) pre-code 1950s horror comics art. P.S. 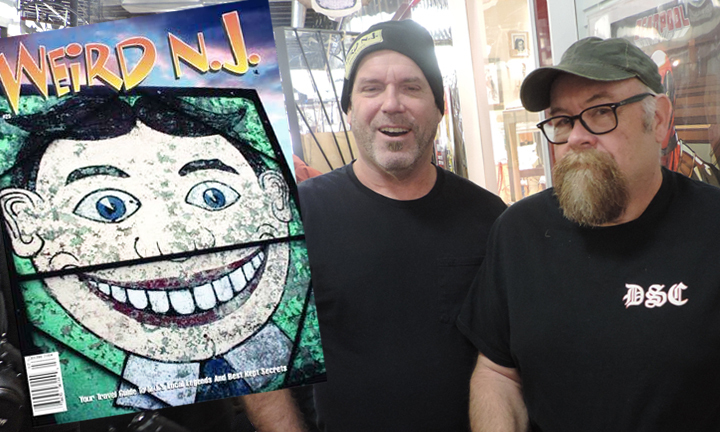 : Neil Vokes had to cancel, but by way of apology, he sent along reproductions of some of his artwork, including a Universal-vs.-Hammer masterpiece (Lon Chaney Sr. vs. Herbert Lom! Bela Lugosi vs. Christopher Lee! Lon Chaney Jr. vs. Oliver Reed! ).